Jenkins, who racked up 10 tackles (eight solo) in Sunday's 20-14 divisional-round loss to the Saints, finished the regular season with 97 tackles (79 solo), a sack, an interception and eight pass breakups. Analysis: While most of those numbers have been fairly standard for the 31-year-old over his past few seasons, the tackle total is a big jump up from the 76 he tallied in 2017 and tied for the team lead with Nigel Bradham. The Ohio State product hasn't missed a game in his five years with Philadelphia and should be locked in as the starting strong safety in 2019. Jenkins had 12 tackles (nine solo) in Sunday's 30-23 win over the Rams. 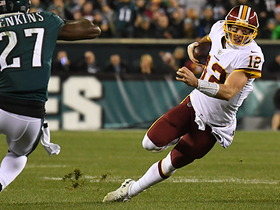 Analysis: Jenkins had two tackles for loss, as the Eagles were able to force three turnovers by the Rams offense. The 30-year-old has now reached double-digit tackles in back-to-back weeks to bring his season tackle total to 88. Jenkins recorded 11 tackles (nine solo) during Sunday's 29-23 loss to the Cowboys. Analysis: Jenkins played all of Philadelphia's 99 defensive snaps, resulting in a season-high performance in single-game tackles. The veteran safety is a solid IDP play heading into a Week 15 tilt against the Rams. Jenkins had two solo tackles and a sack in Monday's win against Washington. Analysis: Jenkins had his lowest tackle output of the season but compensated for it a bit by notching his first sack of the year. The veteran strong safety had 66 tackles (53 solo) with three forced fumbles, a sack and an interception heading into next week's game at Dallas. Jenkins had six tackles (five solo), an interception and a forced fumble in Sunday's win over the Giants. Analysis: Jenkins showed up as a playmaker late in the second quarter as he jarred the ball loose from Bennie Fowler -- unfortunately the ball bounced out-of-bounds before being recovered. He took a field-goal attempt away two plays later when he recorded the interception. The 30-year-old has 64 tackles (51 solo), three forced fumbles and an interception through 11 games, and has another divisional matchup with the Redskins next week. Jenkins recorded nine tackles (seven solo) in Sunday's 48-7 loss to the Saints. 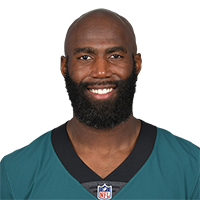 Analysis: Jenkins -- along with Corey Graham -- led the Eagles with nine tackles, which marked a season high for the 10-year pro. He has 16 tackles over the past two weeks and will look to keep it going against the Giants in Week 12. Jenkins was a full participant at Wednesday's practice despite a wrist injury, Dave Zangaro of NBC Sports Philadelphia reports. Analysis: Jenkins was a late addition to the injury report, but his full participation should quell any major concerns. The 30-year-old was sporting a wrap/light cast on his right wrist Wednesday, but the injury shouldn't affect his availability for Sunday's game at New Orleans. Jenkins (thumb) was a full participate from the start of the Eagles' offseason program, Jimmy Kempski of the Philly Voice reports. Analysis: Jenkins underwent surgery on one of his thumbs in March, but the procedure was never expected to be a big deal. The eight-year vet will open training camp as the leader of the Eagles secondary after averaging over 84 tackles and 10 pass breakups in his four seasons since arriving in Philadelphia. Jenkins recently underwent a procedure to repair ligaments in his left thumb, Ian Rapoport of the NFL Network reports. Analysis: Jenkins described the procedure as "offseason maintenance." He should be fine for offseason workouts next month. Jenkins finished the 2017 regular season with 76 tackles (63 solo), a sack, two interceptions and eight passes defensed across 16 games. Analysis: Jenkins played all 16 games for the fourth consecutive year. Perhaps this longevity helped get him elected to his second Pro Bowl because, statistically speaking, he virtually repeated his 2016 season. 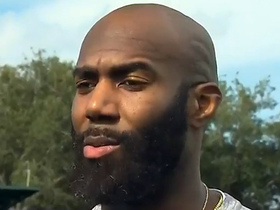 The only major difference was his failure to score a defensive touchdown, marking just the second of eight pro seasons in which he has failed to find the end zone. He is now on the wrong side of 30 and has limited upside in IDP leagues. 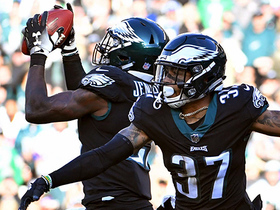 Jenkins picked up nine tackles (four solo) in the Eagles' 34-29 victory over the Giants on Sunday. Analysis: Jenkins' tackle total marked his highest since Week 7 and second biggest total of the season. The 29-year-old strong safety was one of three Eagles defenders to participate in all 88 defensive snaps. He figures to be in line for another heavy workload in the Eagles' Week 16 matchup against the Raiders, as the team hopes to lock up home field advantage for the playoffs. 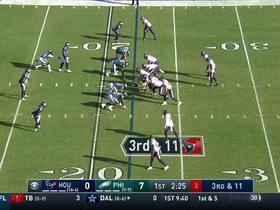 Houston Texans quarterback Deshaun Watson takes off and converts third-and-long. 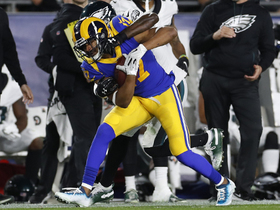 Los Angeles Rams wide receiver Robert Woods tightropes the sideline on 18-yard catch and run. 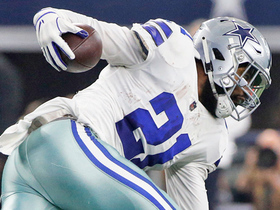 Dallas Cowboys running back Ezekiel Elliott reaches out to convert on a key fourth-and-1. 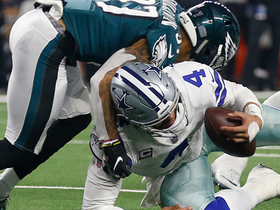 Dallas Cowboys quarterback Dak Prescott can't control the low snap on a costly loss of yards. 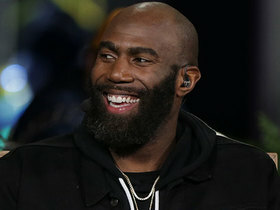 Philadelphia Eagles safety Malcolm Jenkins works beyond the football field for the community. 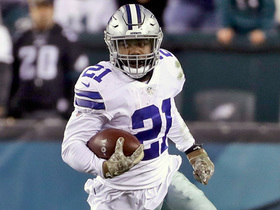 Dallas Cowboys running back Ezekiel Elliott finds the open hole for a 35-yard run.